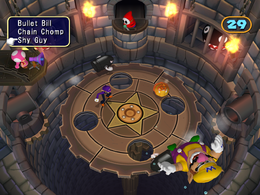 Wheel of Woe is a 1-Vs.-3 Mic minigame in Mario Party 7. Its name is a reference to the game show Wheel of Fortune. The mini-game is set in a dark, brick-walled room, with torches lit on each side. The solo player's goal is to eliminate the other three players in the time allotted. The other three ride on a cog. The Single player can call various commands. Commands include having Bullet Bills launch from Bill Blasters, having Chain Chomps released from their cages to attack the three other players, and having the Shy Guy control the direction the cog spins in. Mic – Say: "Chain Chomp", "Shy Guy", "Bullet Bill"
Rules – "One player uses the Mic to unleash enemies on the other 3 players. Last one standing is the winner!" Advice – "If a Bullet Bill is on your tail, jump on it to make it crash." This page was last edited on January 16, 2019, at 21:17.